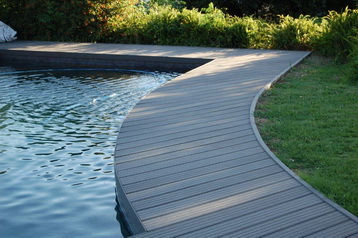 Decking can be a great way to extend your living space into the garden, perfect for socialising, outdoor dining, or as an addition to your pool area. Unlike traditional wooden decking, the 4 Everdeck system uses a composite material that gives you all the benefits of wood, without the need for continued maintenance and re-staining. 4 Everdeck has been developed to reproduce the look and feel of wooden decking while adding a nonslip surface for superior safety, offering superior versatility for any installer. Our range of decking tiles and boards allow you to get really creative with your deck, freed from the restrictions that you might encounter using conventional hardwood decking. Easy to work with using normal woodworking tools, our decking can be cut and shaped without the risk of splitting or splinters, ensuring a superior finish that will last for many years to come. Choose 4 Everdeck and you won’t have to worry about rot or water damage - our decking is made using reclaimed wood fibre that’s combined with recycled polymer resins to created a composite material that resists water ingress and rot, so you won’t spend your weekends inspecting, sanding and staining ever again. 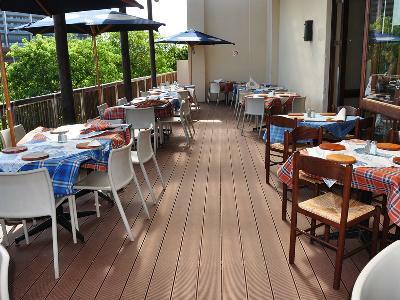 If you’ve had wooden decking before you know that there’s a strong risk of warping, especially in the long hot summers we enjoy in South Africa. 4 Everdeck doesn’t suffer from this vulnerability - and its construction ensures it stays true no matter what the weather throws at it. When correctly installed your new decking will not be affected by rain or shine, giving you an attractive outdoor area all year round. No more hours spent scrubbing, staining and sealing your decking - just high-quality decking that will enhance your home and your social life too. 4 Everdeck is rapidly becoming the first choice for homes and businesses across South Africa and we have installers in all major towns and provinces for your convenience. We’ve also made our decking system available direct and we’re able to dispatch our decking nationwide, ready to provide many years of outdoor enjoyment for you and your family.